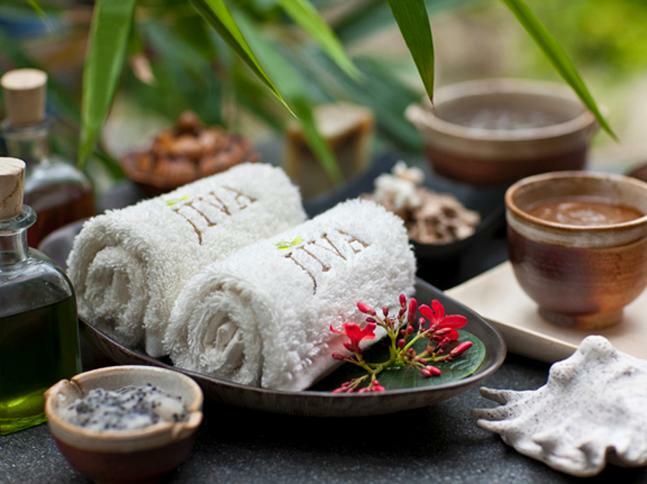 Recently given a contemporary Indian inspired renovation by JIVA Spa, the Vivanta is a popular four star resort in the Maldives. 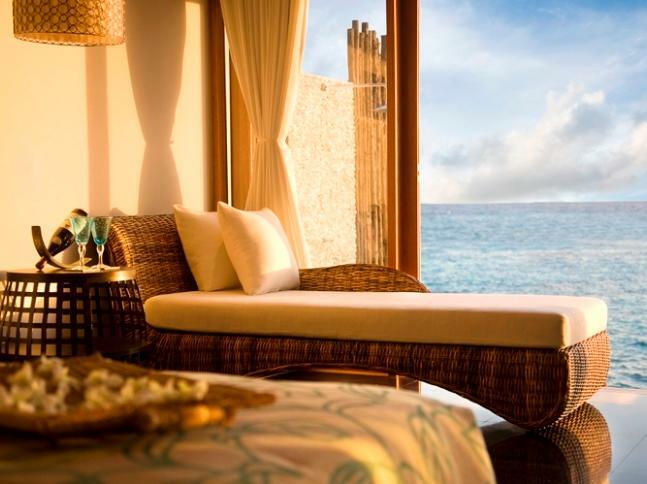 Accessed by a 50-minute luxury speedboat trip, this extraordinary resort is located on the North Male Atoll, and is a high end resort offering maximum comforts in a hideaway location. 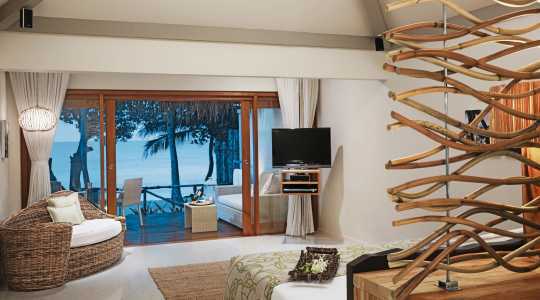 Boasting a great variety of stylish villas in a serene environment, surroundings of the spectacular Indian Ocean and powdery beaches, Simply Maldives Holidays recommends this resort for those seeking great value coupled with exceedingly high standards. 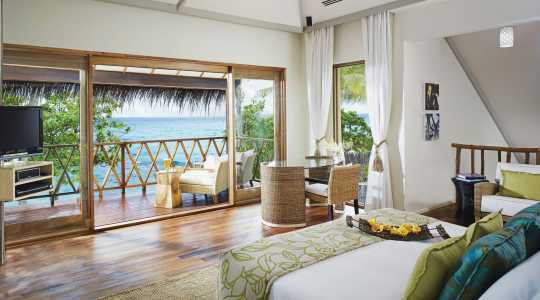 With facilities such as a 24-hour diving centre and fine dining establishments – Vivanta by Taj Coral Reef truly delivers that paradise dream you wish for. 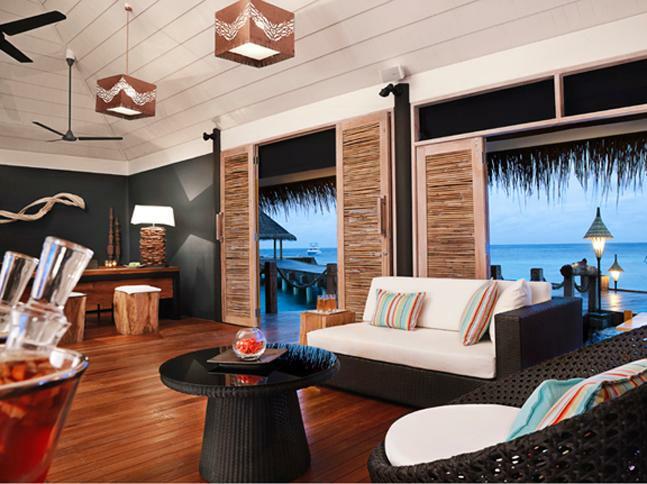 Decorated with the Vivanta’s signature relaxing pastel tones, each of the 12 Charm Beach Villas features an eye-catching thatched roof and grand entrance. Each chic villa spans 58 square meters, thus provides you with plenty of space to really relax during your extraordinary Maldives holiday. Inside you will find all of the standard facilities that you will ever need, as well as a large double bed which faces the sea and is wrapped in the very best linens. 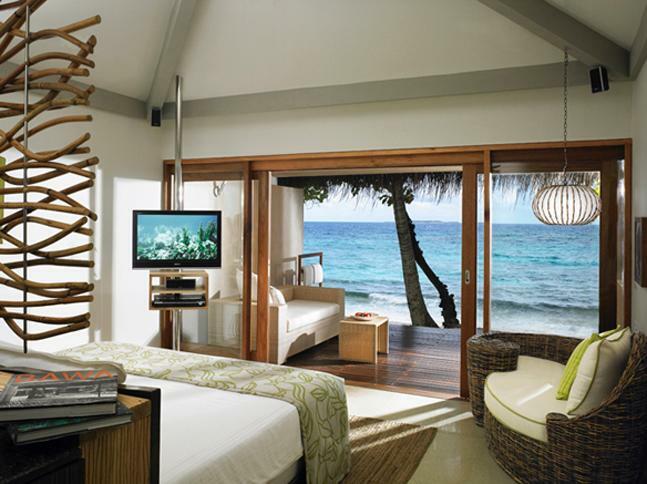 If it is breath-taking beach views you are dreaming of, then Simply Maldives Holidays suggests one of the 16 amazing Deluxe Beach Villas. 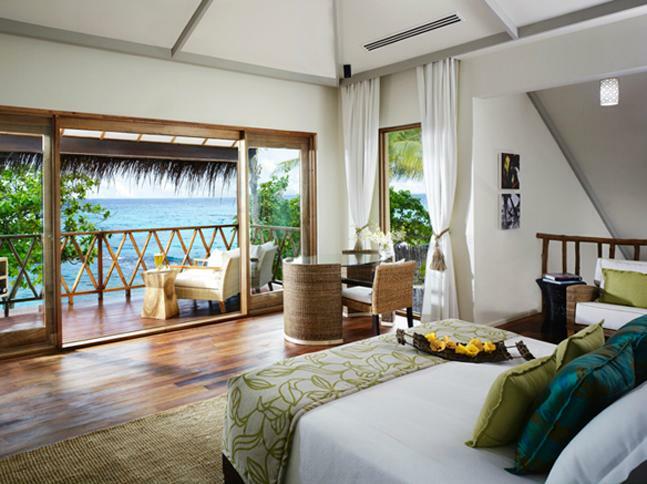 Each features a large clear glass bay window where you can enjoy undisturbed views of the spectacular Indian Ocean’s horizon from the comfort of your very own villa. With 66 square meters of floor space, you will have plenty of room to unwind inside or outside on the private deck. 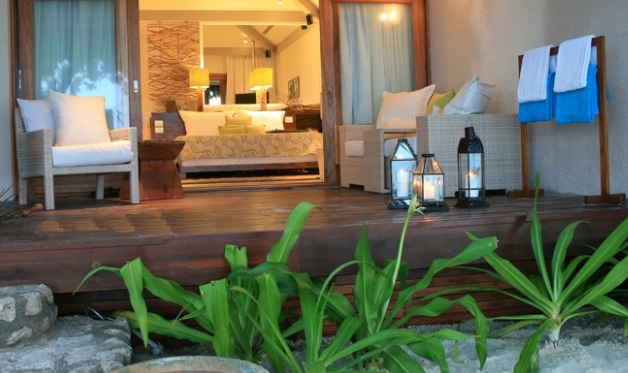 The decked area features a castaway like a hammock perfect for afternoon naps or curling up with a book, as well as outdoor furniture where you can enjoy a romantic breakfast, lunch or sunset cocktails. With an impressive jetty entrance, the Premium Water Villa is the perfect option if you want to truly indulge in your fantastic Maldives holiday. 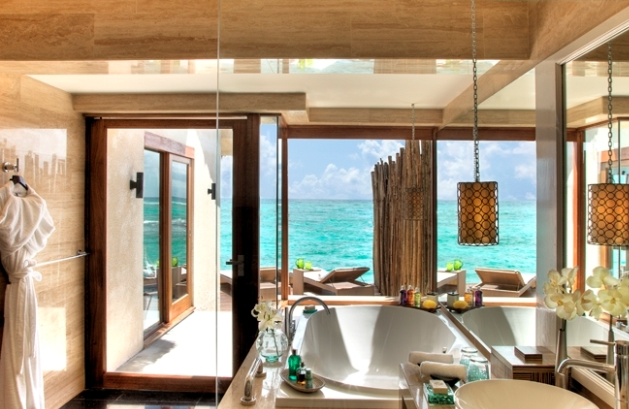 Each of the 82 Premium Villas provides complete privacy and measures a healthy 85 square metres. 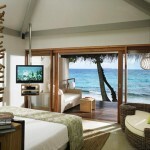 Wake up each morning to the glorious horizon in your large sea the facing bed, and enjoy the awakening outdoor shower. 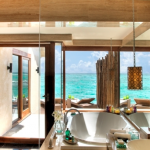 As well as a spacious outdoor deck ideal for romantic meals and simply relaxing, there is a large bathroom with a deep tub for soaking with views of the amazing turquoise lagoon. 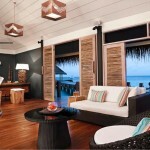 This chic villa also comes with the added benefit of a generous walk in wardrobe and a rain shower. If you want a truly magical experience Simply Maldives Holidays proposes staying in the Two Bedroom Nivarana Beach Suite with Pool. Only two of these exclusive villas are available, and they are ideal if you want plenty of space as each spans to an impressive 215 square metres over two beautifully decorated floors. 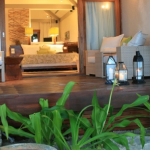 Soak up the exotic sunshine in the privacy of your own private decking area, which is complete with a sensational plunge pool, outdoor furniture and sun loungers with umbrellas. The inside of this villa is simply amazing and includes both a large double bed and twin beds – making it ideal for groups and families. A separate open plan living/dining area gives you even more space for relaxing, and the daybed, pantry and powder room provide an added touch of luxury. 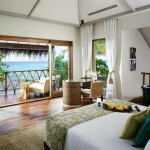 Vivanta by Taj Coral Reef Maldives has a wide selection of excellent facilities to ensure your stay is as relaxing as possible. For instance, there is a babysitting service available should you have children, a laundry service, a beauty salon, internet access, library and a gym. 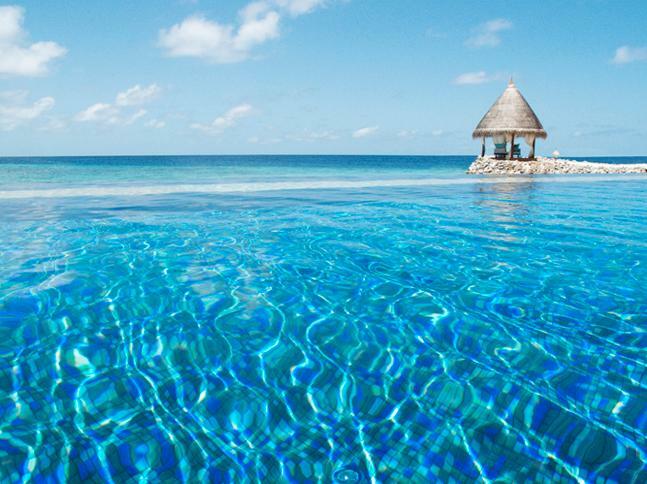 Plenty of activities are available for you to enjoy each day of your luxury Maldives Holiday, some of which include deep sea fishing, fun banana boat rides, badminton, canoeing and of course diving where you can discover the beautiful coral reefs of the Indian Ocean. 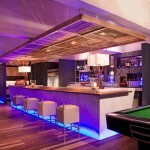 For a wide variety of entertainment Simply Maldives Holidays advises you make way to the resort’s very own Reef Bar. 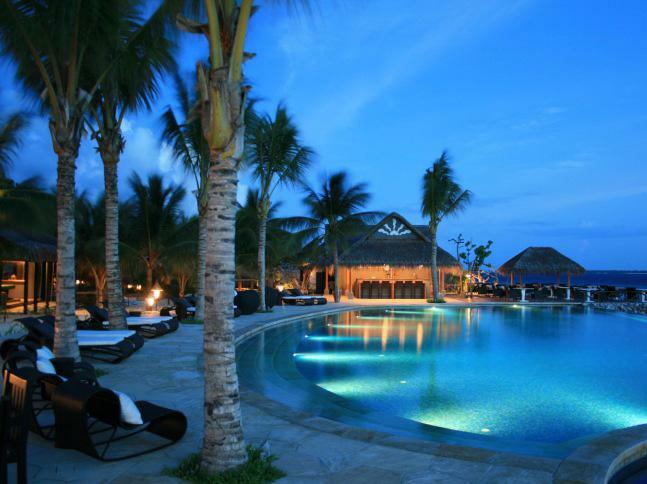 Here you can enjoy the infinity swimming pool and the open-air bar, which frequently hosts a plethora of live entertainment and fun activities for the whole family. 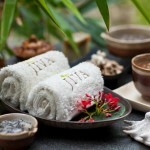 Bringing you ancient health and beauty treatments from Asia is the Jiva Spa. 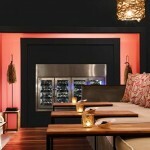 Whether exploring the boutique, the massage rooms or steam room, relaxation and pampering are guaranteed. The spa offers a vast range of wonderful treatments using the very best blend of herbs and oils, so prepare to be spoilt. 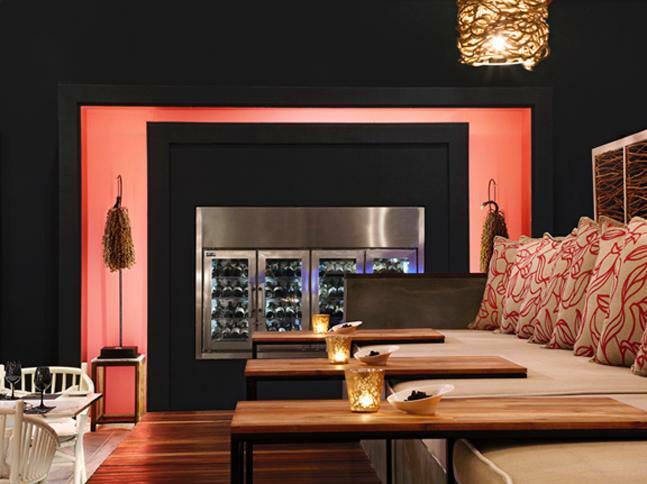 This resort boasts two excellent restaurants. 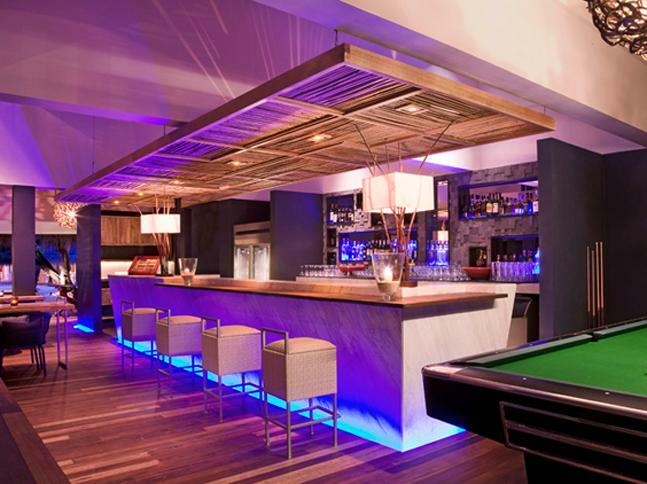 With its mouthwatering Pan Asian inspired menu, prepare for an amazing feast at Latitude. This first-class restaurant has a private dining room featuring an extensive wine display and is a wonderful place to enjoy a romantic meal at sunset. The a la carte menu has been created by the Vivanta’s Executive Chef and is available for your pleasure for breakfast, lunch and dinner. 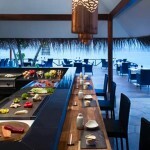 For a more laid back alfresco dining experience Simply Maldives Holidays suggests you head to Open-The Grill. 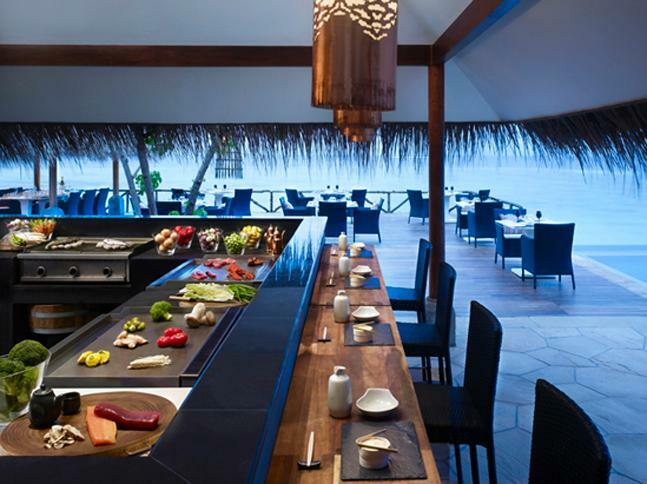 It is at this restaurant which overlooks the swimming pool and striking lagoon, that you can sample a huge range of delicious creations. These range from amazing light dishes made from the freshest ingredients at the Sushi Bar, and comforting Italian cuisine such as wood oven baked pizza. 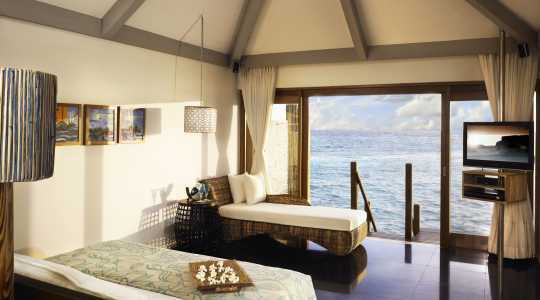 Simply Maldives Holidays offer Bed and Breakfast, Half Board, Full Board and All-Inclusive packages to guests staying at Vivanta by Taj Coral Reef. 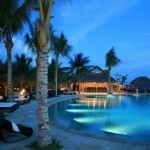 One complimentary dinner at the Latitude Beach restaurant with a bottle of red/white wine. Plus a photography session with one free picture of choice and a bed and bath decoration once per stay. Valid for honeymooners travelling no later than one year from registered date of marriage. 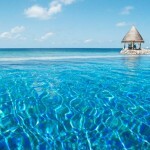 Resort reserves the right to request a copy of the marriage certificate.